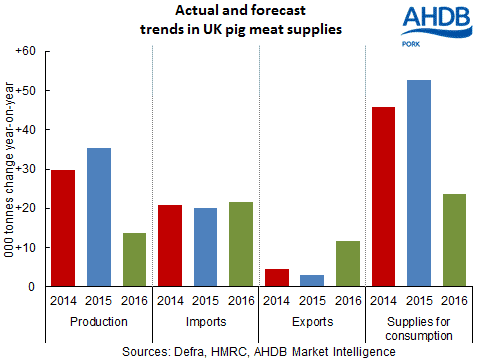 UK - Supplies of pig meat on the UK market are likely to increase further in 2016, according to latest forecasts from AHDB Pork. So far, there has been little sign of a reduction in the breeding herd, although that is expected to change in the coming months. Therefore, domestic production is forecast to rise for the seventh consecutive year, albeit at a slower rate than in the previous two years. Imports of pork are also expected to increase further, given that the gap between EU and UK pig prices remains high. This should be partly offset by higher exports, particularly if the recent weakening of the pound is sustained. Overall, this will mean another rise in supplies, which will keep the pig market under pressure unless demand increases accordingly. Although the forecasts suggest another difficult year ahead for producers, there are some glimmers of hope. Input costs remain low, notably for feed, and there is currently little to suggest that this will change, with high stock levels and crops in reasonable condition. The exchange rate has also become more favourable, with the pound weakening against the euro since the turn of the year, making UK pork more price competitive, both at home and abroad. On top of this, contraction in the EU breeding herd is likely to lead to tightening supplies as the year progresses. This could mean firmer prices on the continent, which may provide some support to the UK market in due course.